We all have talismans, good luck items we carry throughout life. One of mine was Big O, a bright orange winter EMS jacket I bought in 2004 that simultaneously keeps me warm in cold New York City weather and makes me the most easily spotted person on an island awash in black and grey coats. The jacket became a part of my identity. It was different; it was unique. Just like me! Or so I’d imagine. However, the time has come to rid this good luck charm. For the last two winters, my infinitely wiser and smarter better half has pushed and prodded me to place Big O in the department store in the sky. I’ve put it off but now, after two consecutive nights of being the target of drive-by beer spillings at concerts, I face something I’ve never faced before: buying clothes online. I know what you’re thinking. How could someone not shop online, like, ever? The thing is, I like trying things on; I like talking to sales associates and get their opinions. Blame my parents or my communications background or my job as a reporter. 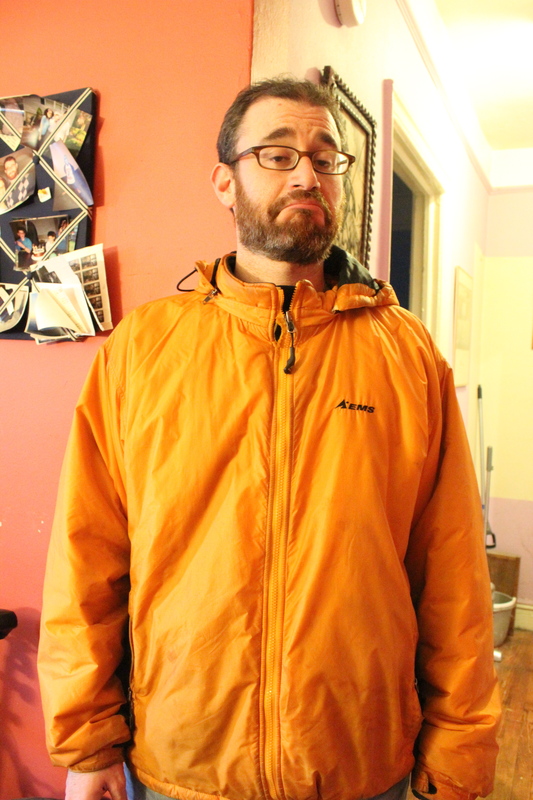 But I needed a coat and my wife finally convinced me that I should just go to Zappos and get a coat. “It’s just easier,” she said. My anxiety rose when I went to Zappos: what type of jacket; what brand; what color; what size? Typical “where to start” questions. From there, the thoughts became a bit more philosophical, as I thought about the efficacy of advertising. We all say advertising doesn’t work on us, that we’re too smart to be manipulated to think of a product or brand while we’re shopping. That’s just not true, and research — both qualitative and quantitative — has proven that advertising works. But when I’m staring at a screen, looking for a piece of clothing, how do I know the years of messages, from both online and off, are penetrating my consciousness. Naturally, I had to step away from the computer for a few minutes and hug Big O.
I wound up defaulting to one key shopping metric: price. I didn’t look for any particular brand (because I don’t really know any) and, perhaps foolishly, I didn’t ask my social networks — again, both online and off. My wife gave me a suggestion or two, and after spending all of 10 minutes looking at a few different brands, I ended up on one she recommended, a brand called Mountain Hardwear. Another reason why I don’t shop online is that I don’t want ads following me around. I’m the kind of shopper that a) rarely buys anything unless it’s necessary and b) when I do buy something, it’s typically an item that will last a while, like a TV or a computer or a winter coat. So now that I bought a winter coat online, naturally, I’m being followed by other winter coats. Because, hey, why not advertise to someone who just bought the thing you’re trying to sell? Perhaps because I don’t buy items online or click on ads or that I’m not seen as a high-value target, I don’t get the benefit of what online advertising can do. Of course, I would be A-OK if I started to get served ads for gloves, hats, sweaters, those tangential products that go nicely with a warm winter coat. But I guess that would mean actually buying stuff online. Now I have a brand new winter coat, one that lets me blend in with everyone else. I am no longer unique, but that’s OK, because I’m warm. And while Big O was a totem for the past 9 years, it wasn’t the only one. And thankfully, if beer spilled on the other ones, they wouldn’t get ceremonially discarded. Josh Sternberg is the content strategist for The Washington Post. Prior to that he was the media reporter for Digiday. Additional bylines include: The Atlantic, The Awl, Pacific Standard, Mashable, Huffington Post, Mediaite. This made me chuckle. You should give it a proper viking burial.